Thursday regulars at Moon Dog's brewery bar, or indeed their Facebook followers, will be aware that each week the crazy kids like to unleash a new single keg experiment on one of their taps. Usually high in booze content, almost always featuring some unusual ingredient and definitely an excuse for one of them to exercise his skills on MS Paint, it is also a chance for the brewers to try out some new ideas that may or may not graduate beyond the 50 litre stage. 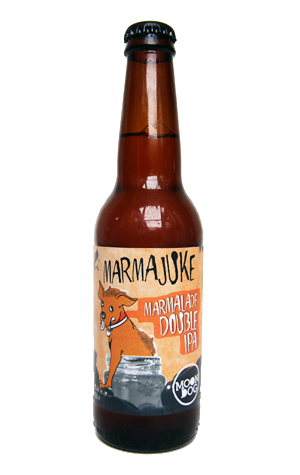 First to graduate is Marmajuke, a citrus'd to the eyeballs take on their Jukebox Hero IPA. As well as nudging the ABV up a little, they've given the six hops company in the form of "a vast concoction of citrus peals and orange liqueurs" added at the end of fermentation. [Pedant Alert!] While this description brings to mind the rather lovely image of the Moon Dog team lobbing a bunch of dimple-skinned fruit at the steel tanks and seeing who can get the loudest "dong" or "chime"† from the contact, we assume they mean peel; either way, whether it was lobbing of fruit or mere addition of peeled skin, the result is the arrival of a Cointreau like bitter macerated orange aroma alongside the hops and lightly stewy malts and a beer that's like a juicier, slightly sweeter but not noticeably more bitter take on its wee brother.